By Karrar Haider in Mobile. Updated on April 7, 2018 . If you check the app reviews before downloading an application from Google Play Store, then you must have seen someone saying "the app was great, but the latest update broke it". Yes, updates to Android apps is not always a good news for some people. If you are not happy with the update to your favorite app, then you can easily revert back to the old version without much hassle. In this post, I will show you how you can download and install old versions of Android apps. Why app updates can be bad? The new update may have many bugs that you may not be comfortable with. Developers tend to keep their apps updated with the latest version of Android. So if you have an old Android version, the new interface and features compatible with new Android version may break the app. Your device hardware may not be compatible with the updated version of the app. You may not like the newly added features or the interface overhaul. Your favorite feature may get removed for any reason. The updated version may get filled with ads. 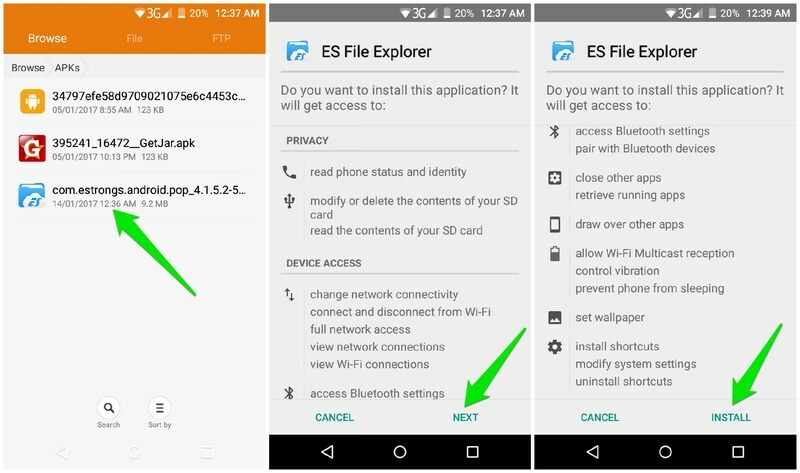 ES File Explorer is a good example. If you are dealing with any of the issues above, then rolling back to an old version will definitely fix things. Unfortunately, Google Play Store doesn’t offer any button to easily revert back to an older version of the app. It only allows developers to host a single version of their app, so only the most updated version can be found on the Google Play Store. On top of this, Google automatically ensures all the apps in your Android phone stay up-to-date. So you can expect your apps to be automatically updated to latest version even if you didn’t like the update. If you want to use an older version of an Android app, then you must download or sideload it from another authentic source. Let’s see how you can do it. 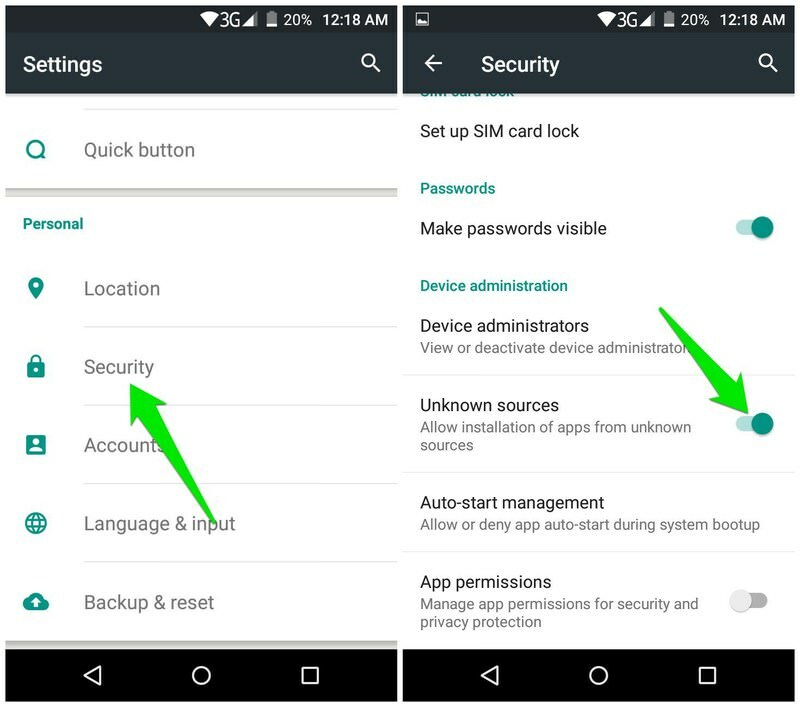 You need to enable Unknown Sources option in your phone settings that will allow you to download and install apps from any source. Go to your phone’s Settings and tap on Security. Here scroll down and tap on the toggle button next to Unknown Sources to enable it. To ensure your apps don’t get automatically updated to the latest version, you need to disable automatic updates in Google Play Store. In Google Play Store, tap on the hamburger menu at the top-left corner of the screen and select Settings from it. 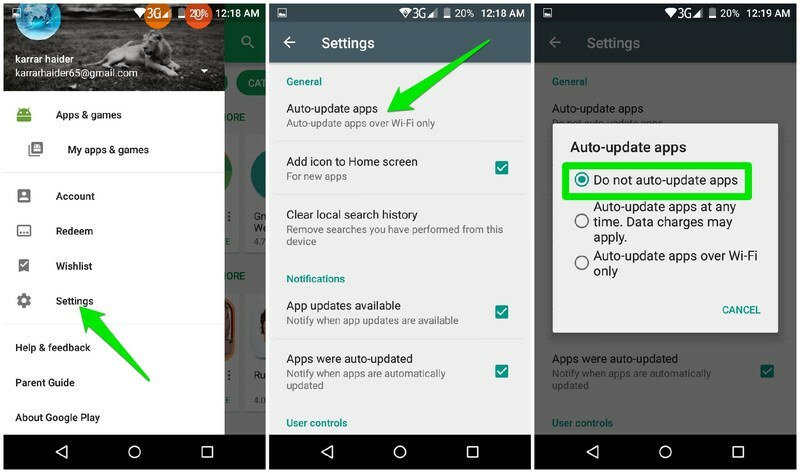 Now tap on auto-update apps option and select "Do not auto-update apps". Now your apps will not be auto-updated when new updates will arrive. Instead, you will be prompted to allow the app to be updated whenever a new update is released. You need to decline updates for apps that you don’t want to update. To install an older version of the app, you need to uninstall the updated version. Unfortunately, with this action, all your app data will also be deleted. So before deleting, make sure your data is backed up in the cloud. Most apps automatically backup and restore data from the cloud, but you can also use Google’s backup service to ensure your data gets backed up. Go to Settings >Accounts> Google, and here make sure App Data sync is enabled. If your app data is backed up, then uninstall the app like you normally do. You need to download your required app’s old version APK file (installer file) from an authentic source. 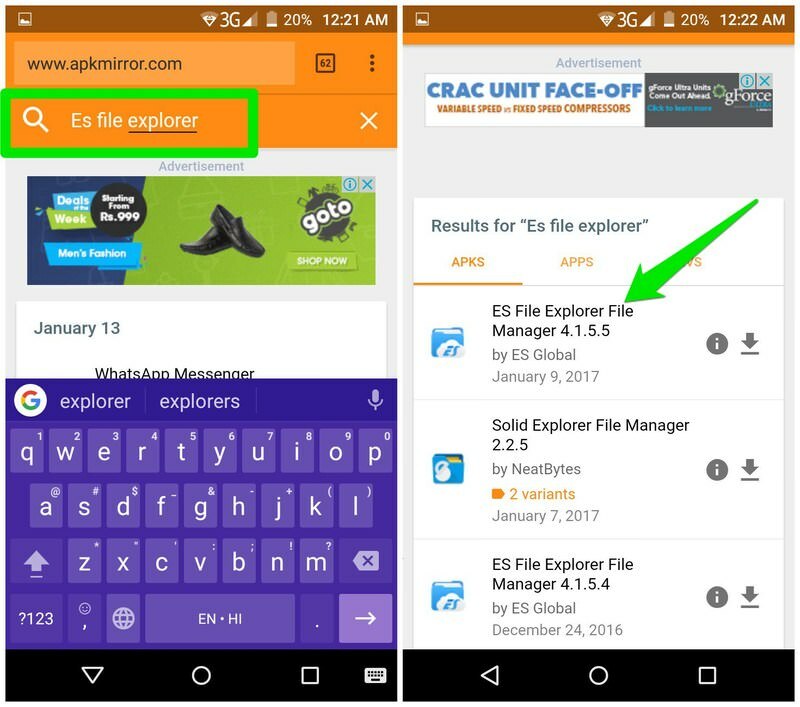 For this purpose, APKMirror is a great website that has huge data on apps and their old versions and known to have malware free APK files. I will be using this for demonstration purposes. If you are unable to find your app’s APK file on APK Mirror, then you can also use other authentic websites I have mentioned at the end. Warning: Try to only download APKs from the authentic sources I have mentioned in this article. 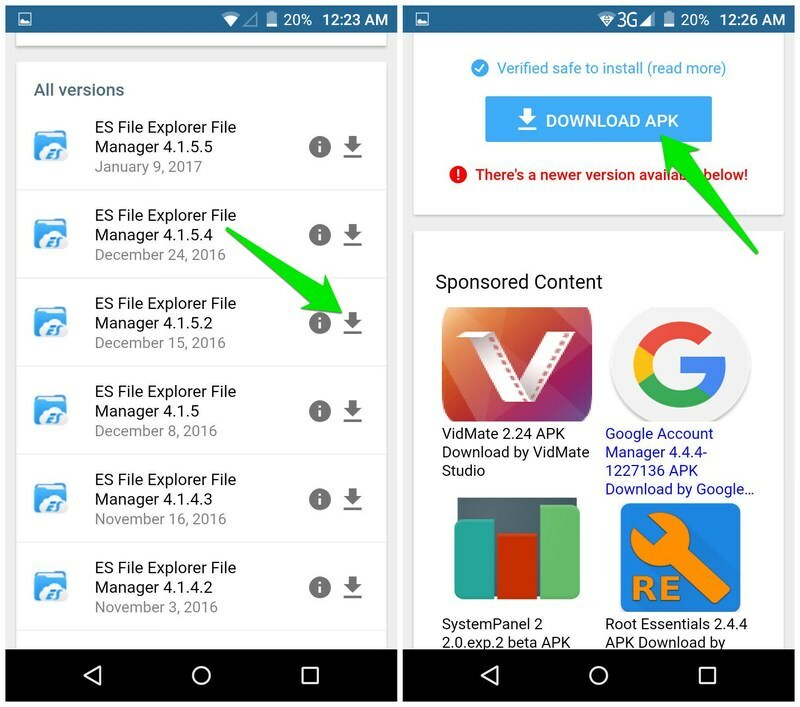 There is a high chance you may get a malware infected APK file if you will download from a shady source. Go to APKMirror website and enter the name of the app you are looking for in the search field on top. You should see the latest version of your app as the top result. Tap on the app and you will see more details about the app. Here scroll down and you will see an All versions section below. This section lists all of the available versions of the app along with version number and the date it was released. Look for the version you need and tap on the Download button next to it. On the next page, tap on Download APK and it will be downloaded. Here are some other websites you can search to get your APK file. Note: You can also use your PC to download the APK file, but you will have to move the APK file to your phone memory by connecting your phone to your PC using a USB cable. If you used your phone to download the app, then the APK file should be placed in the Downloads folder. Installation is really easy, just tap on the APK file you downloaded and then tap on Next button below to grant the required app permissions. After that, tap on Install to install the app in your phone. If you frequently depend on old versions of apps or don’t want to depend on a third-party website for storing APK files of your favorite apps, then you can also create a backup of APKs yourself. You can use an app to backup the current version of your apps to the SD Storage. The backup will be saved as APK file and you can install it again any time you like if a newer update breaks the app. For this purpose, App Backup Restore is a great free app that lets you backup APK files of individual or all apps in your phone and easily restore them. Sometimes older versions of apps can be better than the new versions. Especially when developers try to attract users with awesome features and then use shady schemes to make money. Did your favorite app break after the update? Do share your experience in the comments below.